Note: this article was published in April 2018. For an updated article published in January 2019 on the automotive eCommerce market please follow the link. • Auto parts ecommerce sales will break $10B for the first time, excluding auctions and used parts; a key automotive aftermarket industry trend for 2018. • Power of digital influence: Almost $138B in parts sales, through online/offline channels, are influenced by online activity. • Over $5B in parts & accessory sales will be on mobile devices in 2018. • Automotive Aftermarket Suppliers Association (AASA) projects the total aftermarket to have compound annual growth rate of 3.6% through 2019; Do It Yourself (DIY) retail sales to grow at about the same rate. • Amazon 1P and 3P sales of auto parts & accessories will reach $6.9B in in 2018. All online forecast stats are for the US only. 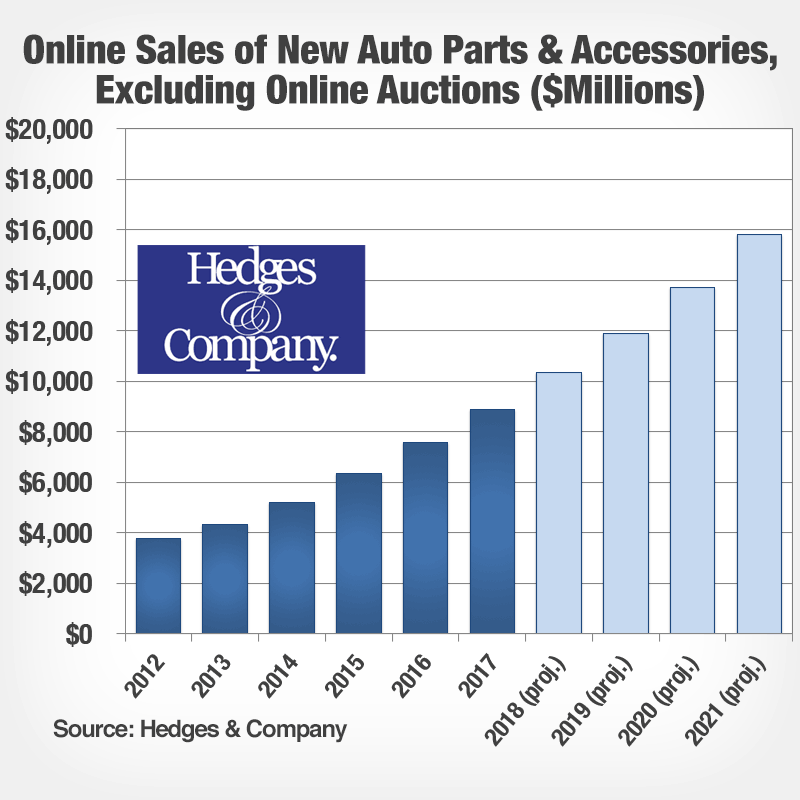 The automotive aftermarket continues its dramatic shift as online retail parts sales in 2018. It will exceed $10 billion for the first time, posting a 16.3% increase over 2017. Even more amazing, however, is how online influences retail sales through chain stores and traditional brick and mortar retailers: Online will influence nearly $138 billion worth in auto parts & accessory sales in 2018. 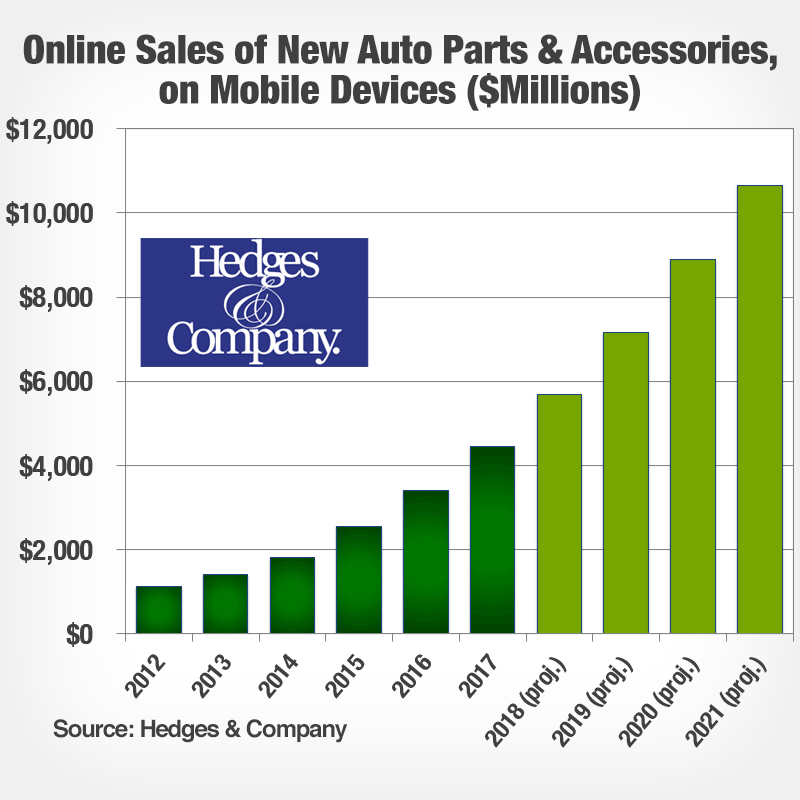 Auto parts ecommerce sales continues to outpace traditional brick and mortar retail sales. There was an average 18.5% growth over the past couple of years. Our automotive aftermarket trends forecast shows for gradual slowing over the next few years. We project an annual growth rate of 15% to 16% through 2021. We’re forecasting nearly $16 billion in online sales in 2021, and nearly $152 billion in parts & accessory sales to be influenced by online in 2021. The power of digital influence: $138B in #autoparts sales through all channels in 2018, including chain stores and traditional brick and mortar parts stores, will be influenced by digital Click To Tweet Online is a huge influence on all auto parts sales, even sales through traditional retail channels. Online presence and activity by consumers and service professionals is influencing sales like never before in history. It is one of the most important automotive aftermarket trends in 2018. 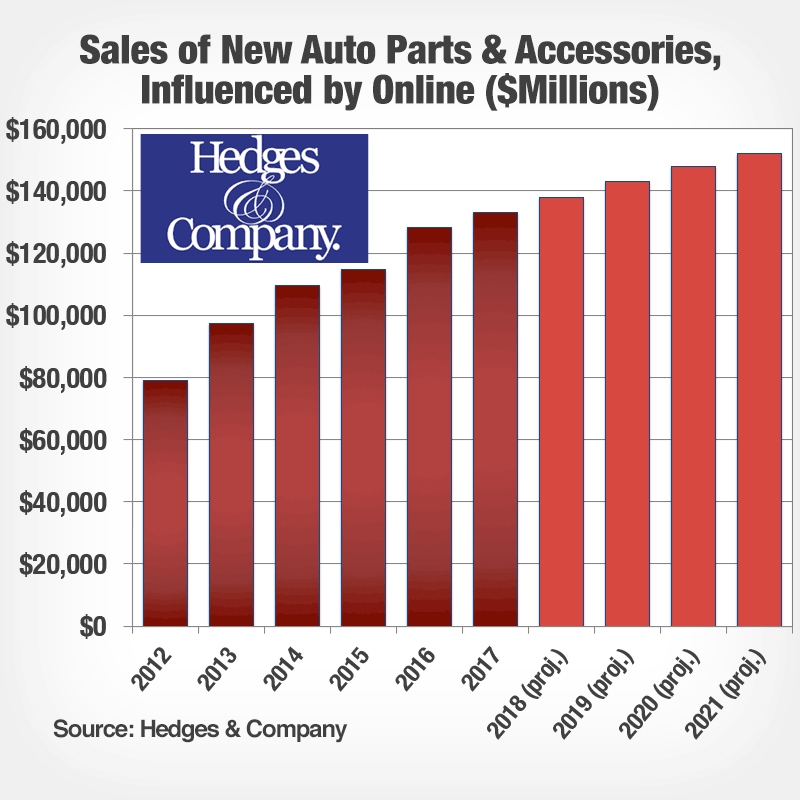 Nearly $138 billion in parts and accessory sales through all sales channels will be influenced by the Internet. “Online presence” and “online influence” are digital influence. This is defined by consumers doing online research before buying a part. This includes reading information and checking fitment on a manufacturer’s website. Consumers see online advertising, and they read product or reseller reviews. They also go to automotive forums, or conduct search on Google or Bing. The four most popular locations of online research used by consumers are: 1) Online search (74% of all consumers); 2 Online auto parts retailer websites (73%); 3) Manufacturer websites (57%) and 4) Automotive forums (47%). Online advertising has a broad reach, too, beyond text ads while consumers are searching on Google or Bing. It also includes Google Shopping and Bing Shopping, as well as banner ads on various display networks. 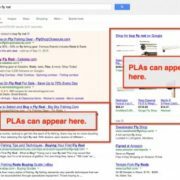 For example, the Google Display Network is the largest online ad network in the world, appearing on 2 million websites – although consumers may not be aware that the ads are coming from Google. This also points out the importance of manufacturers in taking control of their own brand message with their website. By 2021, digital will influence nearly $152 billion in parts and accessory sales through all retail channels. This includes chain retail stores, automobile dealers, big box retailers, local independent brick & mortar retailers, jobbers, as well as online sales. Online sales includes online retailers as well as manufacturers selling direct. Mobile #autoparts sales will be over $5B in 2018 Click To Tweet Mobile is everywhere today. As Google puts it, we don’t go online, we are online, thanks to the role mobile phones play in our daily lives. Who doesn’t have a phone in their pocket or at least within reach? Google has announced a separate organic index for searches conducted on mobile phones, which will depend on how mobile-friendly a site is and how fast it loads on mobile devices. Online sales transacted on mobile phones will account for $5.7 billion, posting a 30% increase over 2017. It was only a few years ago, 2012, when mobile eCommerce broke $1 billion for the first time. Mobile’s growth will continue to grow at a fast pace, with an annual growth rate of over 25% for the next several years. Our projection shows the growth in mobile eCommerce will start to slow down to around 20% annual growth by 2021 (obviously, at 20%, “slow down” is relative!). While much of the automotive aftermarket has successfully transitioned to mobile-friendly websites, it is still somewhat of a shock to see how much of the aftermarket has not kept up with online technology vs. other industries. If you are a manufacturer or online retailer and you haven’t included mobile strategy in your marketing plans, hey, it’s 2018! Consumers are trying to find your website on their phones. Amazon continues to grow at a fast pace, affecting most consumer goods industries. The auto parts industry is no exception. We’re forecasting Amazon to post $5.5 billion in aftermarket parts & accessory sales, and over $1.4 billion in OEM replacement parts sales in 2018 for a combined total of $6.9 billion. Most of Amazon’s sales growth will come from aftermarket parts, accessories, car care products, maintenance products and chemicals. OEM replacement parts will show a slower growth rate over the next few years. 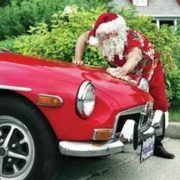 In 2018, @Amazon will sell $6.9 billion in OEM replacement #autoparts and #aftermarket parts and accessories Click To TweetMost of Amazon’s amazing growth in auto parts comes from direct sales, known as “first party sales” or “1P.” You can tell if you are buying directly from Amazon because the product will show Fulfillment by Amazon (FBA) with this description: Fulfillment by Amazon (FBA) is a service we offer sellers that lets them store their products in Amazon’s fulfillment centers, and we directly pack, ship, and provide customer service for these products. 1P sales typically include Amazon Prime offers. The majority of Amazon’s 1P sales come from manufacturers supplying Amazon directly or from warehouse distributors (WDs). We’re projecting Amazon’s 1P sales to hit $4.5 billion this year. We project these 3P sales at around $2.3 billion for 2018. We don’t include these 3P sales in our annual forecast of online sales. That’s because many of these 3P retailers also sell through other channels. See our methodology below for more explanation. We track automotive aftermarket trends closely, and we’ve tracked auto parts ecommerce sales closely each year since 2007. Also, we use a combination of our own proprietary industry research, trends analysis, US Census data, and data from the US Bureau of Economic Analysis. We also have interviews with industry sources and use analysis of third-party data and statistical modeling. About a third of Amazon’s auto parts sales are third party sales. We exclude these from our annual forecast. For our annual analysis we consider eBay and most third party marketplaces to be sales channels. Many online retailers sell through their own websites as well as multiple other sales channels, so including them would result in double counting of online sales. Including auctions would also include individuals selling used parts. For more information on these automotive aftermarket trends you can also contact SEMA market research directly. You can also refer to Auto Care Association market research. This article is copyrighted, but we encourage sharing so it is licensed under a Creative Commons Attribution-ShareAlike 3.0 Unported License and can be distributed or quoted, with credit given to Hedges & Company and a link back to this article. Let’s have a conversation about your online marketing presence. Click the button below to contact us! Full disclosure: Hedges & Company principals do not own stock in any of the companies mentioned. This material has been prepared for informational purposes only, and is not intended to provide, and should not be relied on for, tax, legal or accounting advice. You should consult your own tax, legal and accounting advisors before engaging in investment activity. 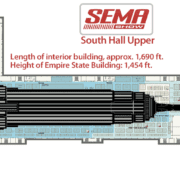 How Big Is the 2019 SEMA Show?